Great location, friendly staff and a very good price. The layout of the area was really great. Nice and close to a very pretty, chill beach. The owners and workers are so nice and so helpful. The room itself was nice size and very cute! I had trouble finding the hotel because I didn't have GPS on my phone yet. I stopped in a restaurant and asked a clerk to call the hotel. Jacob, the owner, and his wife came to where I was so I could follow them back to the hotel. Clean, new and lots of space. Good kitchen and great pool. Good value for money, very close to the beach. Staff are very helpful and always available for help. The hosts were efficient and friendly, the apartment was clean and comfortable and the fans kept it cool. Having Flutterby House with its great restaurant next door was a bonus as was the short walk to a beautiful beach. Great value for the room price. Clean and spacious! Large apartment with 2 separate bed rooms and living room with an equipped kitchen. The site manager is super kind and helpful. Cabin is new and well maintained and also isolated from other cabins. Lock in a great price for Tropical Beach – rated 8.4 by recent guests! One of our top picks in Uvita.Featuring a swimming pool, a garden and a terrace and views of the garden, Tropical Beach is located in Uvita and provides accommodations with free WiFi. 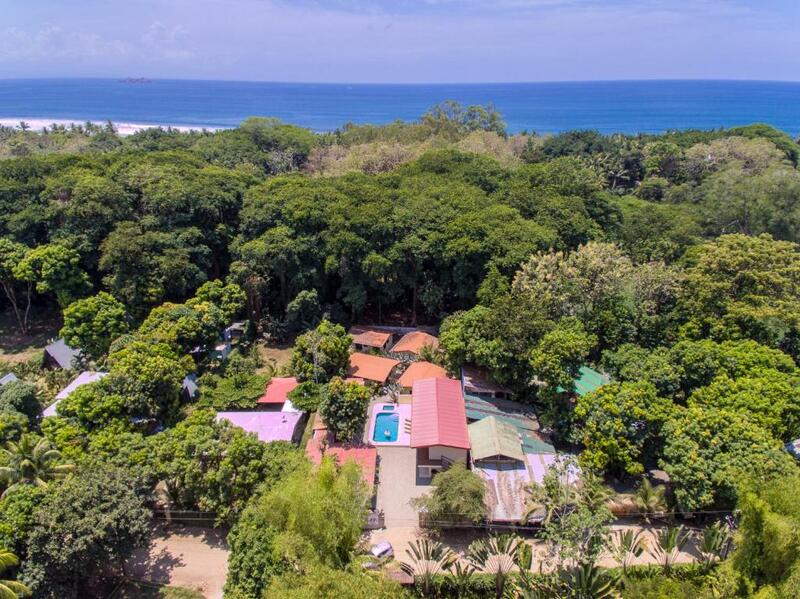 Playa Hermosa is 14 miles from Tropical Beach, while Dominical is 13 miles away. The nearest airport is Palmar Sur Airport, 27 miles from the accommodation. This property is also rated for the best value in Uvita! Guests are getting more for their money when compared to other properties in this city. When would you like to stay at Tropical Beach? House Rules Tropical Beach takes special requests – add in the next step! Tropical Beach accepts these cards and reserves the right to temporarily hold an amount prior to arrival. Please inform Tropical Beach of your expected arrival time in advance. You can use the Special Requests box when booking, or contact the property directly using the contact details in your confirmation. Unprofessional. Hostile staff. Associates smoke on premisses. No house keeping. Suspiciously cash only preferred. Not hospitable. Not a Hotel. Not one of Booking's best recommendations. Lovely owners, food is delicious and good value for money compared with some other overpriced places close by. Next door to popular and social hostel (we normally stay in hostels but privates were crazy expensive) which also has excellent food at very very good prices. Tropical beach has a nice pool area and whilst room was on the small side bathroom was excellent and facilities perfect. Can access the whale tail beach for free by going down a different entrance, a 5 min walk to the beach. A little far to access ATM on foot so bring cash with you, or owner can arrange taxi for 4000 colones return which was good. More like a motel/bnb style place than a hostel but everyone seemed friendly. Our room was not cleaned once, not was there any offer. Requests for laundry were ignored. Any typical expectations of any accommodation no matter the type we’re not met. They are understaffed (don’t have staff) and don’t know what they are doing in the world of hospitality. Quite obviously the Polish people that own the place, and are trying to run it, are new to this and are in way over their heads. Finding the property was harder than it need to be. It isn't signposted from the main road into Uvita and as it is new the park rangers were not familiar with it to give directions. It needs a sign post from the road! But to help... travelling towards Marino Ballena, Uvita there is a small crossroads junction with a bus stop (flutterby house/hostel is signed on this bus stop), turn left here towards flutterby, following flutterby signs Tropical beach is right next door. Flutterby House is also noted on google maps and if we had known this we'd not have got so lost! Also, not so sure about the "Predator" / alien themed furniture of the future restaurant. It seems out of keeping with the Tropical Beach hotel name but who am I to judge... we couldn't try the food as the restaurant was not yet opened when we stayed. This was a stopping off point for us, we had been in the jungle and off to the cloud forest. Uvita was only meant as a facilities stop for us. The room was quiet, spacious and more like a chalet, it had a fridge and small kitchen area, seating area and two bedrooms plus a large bathroom. The chalets were carefully screened from each other by tropical planting. There was a communal pool which was only just completed and a wonderful surprise addition. The beach is minutes from the property, check tide tables at Flutterby House next door if you want to walk to the whales tail. It takes 45minutes each way. There is a large supermarket with many European foods on the main 34 highway to stock up. We only stayed one night as we were passing through but you could easily stay longer if you love beaches and surf. The only thing I didn't like was the noise from the Flutterby Hostel next door; however, there is a 10:00 PM noise curfew until 0700 in the morning and they respected that. I knew before booking that the hotel was still under construction. I was the first person to stay in one of the new units. The furnishings were very basic; a bed, 3 drawer end table, shelf unit, TV and AC. There was no chair or table in the room, nor did they provide any maid service. I swept my own floor and emptied my own garbage. I didn't mind any of this because the rest of the service was great. Mac, the Alien Restaurant owner, and Martin, the other cook (owner?) treated me like family. The food was excellent and beautifully presented. They served breakfast and dinner but no noon meal. The room was just a little bit smaller than we expected. The pool was really nice and it was convenient to have in the place the recently opened bar with some options for meals. The bed was incredibly comfortable and the staff always helpful. The Restaurant is an absolute Highlight! Delicious food and great people! 10 points!! The Hotel is very new, recently finished. Rooms are comfortable and clean. Great and helpful service! Pool and sorroundings are nice. Only a 2 minute walk to the beautiful beach, wonderful location!